Raccoons are not as destructive as black bears, grizzly bears, rhinoceros, or charging elephants, but they are the single most destructive home and garden pest most homeowners in their ranges in the North America and Europe will ever experience. Because raccoons are adorable woodland creatures, many urban areas make killing raccoons unlawful. And because raccoons forage over distances up 1 to 10 miles (1.6 to 16 km) every night, any raccoon you get rid of is often replaced by another. Getting rid of raccoons requires a willingness to use a variety of methods. It is essentially impossible to get rid of raccoons with firearms, bows and arrows, or poisons. Choosing the right bait and traps, however, makes it possible to catch and release raccoons into friendly habitat. The methods of getting rid of raccoons naturally usually only work for a few nights at a time, but a variety of exclusion and control methods used together keeps damage to a minimum. 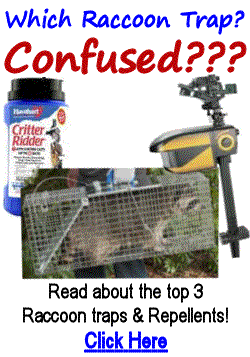 These articles give you tips on controlling raccoons tied to the types of raccoons you are likely to encounter. They warn you of the deadly diseases spread by raccoons and the likelihood of encountering law enforcement should you choose to kill raccoons. There is an effective way of warding off raccoons for every homeowner in these pages, and a Plan B for every Plan A. You just have to be as smart as the highly intelligent raccoon. Does the Law Allow You to Kill Raccoons? In some places it is legal to be able to kill Raccoons and others it is illegal, or you may need a license. This article informs you about what activities you can do in certain states and what is prohibited. What Are the Different Types of Raccoons? Read about the various types of raccoons, where they live, what they eat and what they look like. Raccoons spread many diseases. This is not a problem if they stay in the wild, but if they start to live in the same space as you, then you are putting yourself, your family and especially your pets at risk. Read about the various diseases here.